We are blatantly copying Small Review's post about her amazing Tips and Tricks Challenge. Small Review is one of the most generous bloggers with how she provides excellent step-by- step instructions on how-to's that will make your blog shine! It's that kind of thing where you want to know how seemingly every other blogger in the universe knows how to do it, and you don't want to look like an idiot by asking how it's done. So here's the scoop! 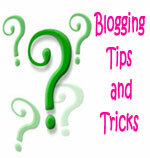 Welcome to the first Tips & Tricks post of this year's Busting the Newbie Blues! Click to learn more about Busting the Newbie Blues! Part of being a newbie is having a TON of questions (and, honestly, oldies have a lot of the same questions). I've answered a bunch of these questions last year through my Tips & Tricks series and I've compiled most of them here for you to browse through. And, because January is all about signing up for challenges, I'm turning this into a mini challenge! Don't worry, there aren't any big rules or requirements (I'm all about fudging challenge rules anyway). There aren't any levels or prizes. It's all very low key. 3) Leave a link to your post/blog so we can all check out your results and give you lots and lots of praise! Not sure how to leave a clickable link? Check out my Tips & Tricks post about anchor text. Any of the following Tips & Tricks qualify, plus any future Tips & Tricks posted throughout this event. YOU CAN DO IT! Now go ahead and pick one! Make sure to come back here and share your success with us! Can you believe it? Small Review listed all her tip posts...with links! If you don't take part in this challenge, you are nuts! Call the guys with the straight jackets and jump in their padded van. There has to be at least ONE How-To that you've been dying to know about. Us? We can't decide which one to try first! Seriously guys, take advantage of this outpouring of knowledge and generosity. We can't wait to see all you do! Such a great list here! I learned how to make and customize a progress bar from Small Review and plan on learning how to make coloured boxes and borders. I love her tips! Thanks for the reminder about all of these things...working slowly but surely!